Earlier this year, Ralph Lauren CEO Stefan Larsson left the company over business-direction differences with the firm’s founder. After a three-month search, the company announced that Patrice Louvet would be coming from Proctor & Gamble (P&G) to assume the top job. Louvet started at Ralph Lauren—#380 on Chief Executive and RHR International’s CEO1000 Tracker, a ranking of the top 1,000 public and private companies—on July 17, when he also became a member of the board. 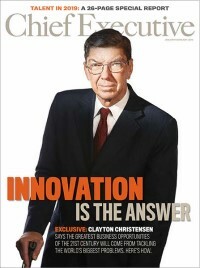 He is only the third CEO the company has had in its half-century existence. Louvet faces the challenge of turning Ralph Lauren around. With struggling sales, the company has been pursuing cost-cutting measures and has closed some stores, and is refocusing its products, marketing and shopping experience. In addition, this will be the first time that Louvet has been the CEO of a company. As he navigates through those issues, Louvet will be able to draw on the insights of founder Ralph Lauren. Lauren was apparently fairly hands-on in the CEO selection process, and it appears he will continue to be closely involved as executive chairman and chief creative officer. In a statement, Lauren said that “finding the right partner to work with me to take us forward in our evolution has been my primary focus over the last several months…” and cited Louvet’s “collaborative working style.” Louvet will report to Lauren, as well as to the board. Louvet’s background is not in fashion and apparel per se, but he brings some related experience to the table. His P&G career has spanned more than two decades, with his most recent role being group president of the company’s $11.5 billion global beauty-products business. During his time at P&G, he oversaw a number of high-profile brands, such as Gucci and Hugo Boss beauty products, and gained turnaround experience as well. That background may serve him well in steering the company through a crowded and changing market where apparel brands sometimes struggle to stand out.